Multiple sclerosis (MS) is an inflammatory disease that affects the nerve cells of the brain and spinal cord. MS is found more commonly in women than in men, and though MS can occur at any age, the condition generally develops between the ages of 20 and 40. A myelin sheath is a protective covering surrounding nerve cells. 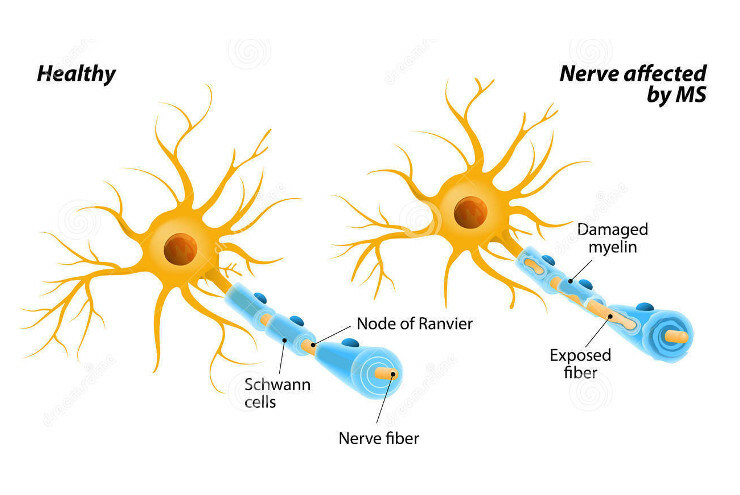 When these are damaged, nerve signals slow down or stop altogether, causing multiple sclerosis. It is unknown what causes the myelin sheath to deteriorate or become damaged, but it may be linked to genetics, certain viruses, or environmental factors. While there is no cure for MS, the progression of the disease may be slowed with a combination of medications and physical therapy. Our physicians have extensive experience in the treatment and care of MS patients. Our neurologists can help those affected by MS achieve and sustain a healthy way of living. If your or a loved one is suffering from MS, consult a neurologist today. Those suffering from MS endure attacks lasting anywhere from a couple of days to several months. These episodes vary in length and severity. Following an attack is a period of reduced or no symptoms called a remission. The disease often returns, or relapses, however, and the disease may continue to worsen overtime. Doctors diagnose multiple sclerosis by eliminating other conditions. They may perform a neurological exam to determine any loss of function in the nervous system, abnormal nerve reflexes, or decreased or abnormal sensations. Patients suffering from decreases in function of two different parts of the nervous system may have MS. The physician may also conduct an eye exam or a lumbar puncture. The life expectancy for those suffering from multiple sclerosis can be normal or almost normal. Most people can continue to walk and work with minimal impairments for 20+ years. As the disease progresses, however, symptoms may increase in frequency and severity. To learn more, contact our Neurology Center at 817-336-3968 .